"Even those who don't like or haven't tried avocados usually like these wraps. They are especially great for a summer lunch with a crisp salad." Spread a thin layer of the cream cheese mixture over each tortilla, dividing evenly. 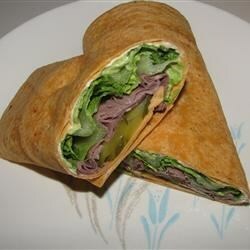 Place a lettuce leaf on each tortilla, and top with two roast beef slices. Sprinkle evenly with avocado, tomatoes, and cheese. Starting at one end, gently roll up each tortilla into a tight tube. Slice in half diagonally and place two pieces on 6 serving plates. This is a very basic wrap. Next time I make it I'm going to probably put extra seasoning in the cream cheese it was hard to taste this time around. I'm not very good at tightly wrapping tortillas so ours weren't as pretty as some other wraps - but the taste more than made up for it! Thanks for a great lunch recipe! This was pretty good. I made this just for me, which was a little tricky to scale down for one, and spread the cream cheese on the roast beef and wrapped everything in Bibb lettuce. Very filling.